MILFORD, Del. (March 22, 2016) – Delaware Nature Society (DNS), a state-wide non-profit organization, in partnership with the Town of Slaughter Beach, would like to announce the installation of a new sign denoting our Marvel Saltmarsh Preserve as well as the awarding of a Lands & Waters Conservation Trust Fund Grant, through Delaware’s Department of Natural Resource & Environmental Control (DNREC), for the design of a public boardwalk to be constructed at the Preserve. The 109-acre Marvel Saltmarsh Preserve was graciously donated in 1989 to Delaware Nature Society by the Marvel family of Milford, Delaware, and DNS’s Abbott’s Mill Nature Center, also located in Milford, has been conducting environmental education programs for students and families at the site ever since. The new Marvel Saltmarsh Preserve sign, installed by Rogers Sign Co., in Milton, DE, and made possible through the generosity of Dogfish Head Craft Brewery’s Beer and Benevolence program, recognizes the Marvel family’s commitment to conservation while furthering DNS’s mission of connecting people to the natural world to improve our environment through education, advocacy, and conservation. Marvel Saltmarsh Preserve, an excellent example of the large expanses of saltmarshes that form much of Delaware’s eastern bayshore, is home to a large diversity of animals including fiddler crabs, blue crabs, grass shrimp, and many species of mollusks and insects. Nesting Willet, Clapper Rails, Red-wing Blackbirds, Marsh Wrens, and Swamp and Seaside Sparrows can be heard singing and calling from the marsh grasses each spring and summer. In the winter, Northern Harriers and Short-eared Owls can be observed hunting low over the marsh. In the spring of 2015, Abbott’s staff and Slaughter Beach community members erected an Osprey nesting platform in the southern end of the Preserve, with support from DNREC’s DuPont Nature Center and funding from the Sussex County Council. The platform hosted a pair of nesting Osprey throughout last summer, and just last week those Osprey have returned to the site after a winter spent in Central and South America. The highly productive saltmarsh is a key component of the food chain in the Delaware Bay estuary, providing nutrients in the form of decomposing vegetation, called detritus, for countless estuarine organisms. These minute, decaying grass particles feed small fish, plankton, oysters, shrimp, clams, and crabs that live in the bay. These smaller organisms are in turn eaten by larger animals, some of which are consumed by humans. The marsh also serves as an important nursery ground for young fish, shellfish, and crustaceans. The Marvel Saltmarsh Preserve’s beautiful open landscape adds to the scenic nature of the town of Slaughter Beach and serves as a natural green buffer by providing flood control during storms for the community. Delaware Nature Society’s environmental education programs conducted at our Marvel Saltmarsh Preserve, averaging 900+ annual participants, stress the important role that the marsh plays in the Delaware Bay ecosystem and in the lives of people that live around it. Additionally, Abbott’s has hosted an annual Horseshoe Crab Spawning & Population Volunteer Survey at Slaughter Beach since 1999, providing the Division of Fish & Wildlife important data used to monitor the species’ health as well as to set harvest limits for Whelk fishermen and the scientific community who use the crab’s blood to test the sterility of medical equipment and prescription medications. The Town of Slaughter Beach has been actively engaged in conservation efforts as well, becoming an official Horseshoe Crab Sanctuary, and becoming Delaware’s 3rd (83rd in the U.S.) Certified Community Wildlife HabitatTM through the assistance of DNS last May. 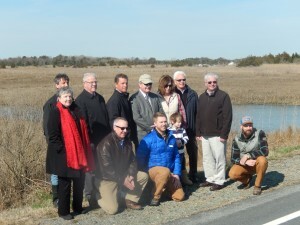 In February of 2016, the Town of Slaughter Beach, in partnership with Delaware Nature Society, was awarded a Lands & Waters Conservation Trust Fund Grant, through DNREC, for the design of a boardwalk to be built at our Marvel Saltmarsh Preserve for the intended use of educational programs and public access. The project to plan, design, and build a boardwalk and elevated observation area at Marvel Saltmarsh Preserve seeks maximize access to the marshlands and tidal pools located in the Preserve, and greatly expand educational activities for students and families visiting the Town to study wildlife habitat and ecosystems. Landscape Architectural Services, L.L.C., located in Milford, Delaware, is overseeing the permitting and design phase for this project, and additional design funding has generously been provided by DNREC’s Bayshore Initiative, Dogfish Head Craft Brewery’s Beer and Benevolence program, and DNS. The Town and DNS will seek additional funding for the construction phase of the boardwalk project. DNS is currently celebrating the 35th Anniversary of our Abbott’s Mill Nature Center, which represents a unique partnership between DNS and Delaware’s Division of Historical & Cultural Affairs and Division of Fish & Wildlife. Since 1981, Abbott’s has provided hands-on educational programs for Delmarva area students and families (188,500+ participants since 2000), while also preserving 482 acres of wildlife habitat and public hiking trails in Sussex County. Our namesake, Abbott’s Mill, is Delaware’s only preserved, working gristmill, and allows visitors to discover over 220 years of history and engineering. Additionally, as the National Wildlife Federation’s state affiliate, DNS has been instrumental in designating over 1,000 yards and 3 communities in Delaware as Certified Wildlife HabitatsTM. Abbott’s Mill Nature Center is located at 15411 Abbotts Pond Road, Milford, DE, and can be reached by phone at 302-422-0847 or online at www.delnature.org/abbotts.